I love living in Chicago though as much as I enjoy the city life, there are times when I need to be away from the hustle and bustle city life. Thus, I could not find a better excuse than celebrating my forty-eighth birthday to escape from the hectic atmosphere of the windy city. With my busy schedule, a staycation was the most obvious way to recharge myself without completely letting go of all my responsibilities. Besides, a little shopping therapy is right up my alley. I already had the Crowne Plaza Chicago O’Hare Hotel and Conference Center in my mind since it’s just one block away from the premium fashion outlet: a two-story mall housed with a 130 stores including Gucci, Etro, Coach etc. This mall is also well known for offering huge discounts on designer goods. I am also a total sucker for customer and guest reviews so I just had to check out this hotel online before I made any commitments. Fortunately, the Crowne Plaza O’Hare Hotel & Conference Center has a positive 4.3/5 stars on over 1300 reviews. To accompany me, I invited my dear friend and photographer Roxy Yang to tag along for the fun. As soon as we walked into the front lobby, friendly staff members greeted us. The décor of the lobby is beautiful and modern. We had the privilege of staying in the CEO suit, which features a spacious parlor including a queen soft sleeper, adjacent bedroom with king bed and separate writing and vanity area and some of the Crowne Plaza's top amenities. In the parlor, there is a pull out sofa bed, which is perfect if you are staying with a larger group. The entire suite room is accented with light blue furniture, which helped brighten my mood right away. 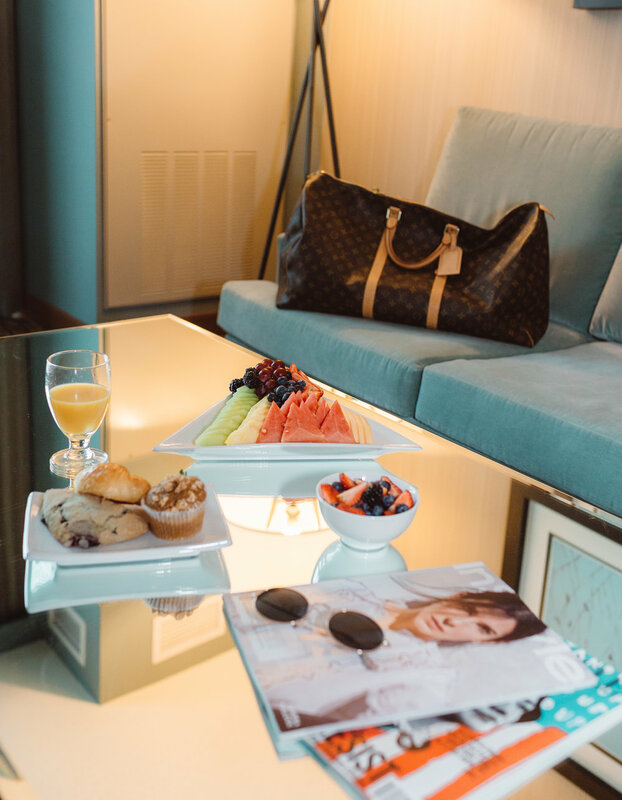 I was also pleasantly surprised to see balloons and a variety of fruits waiting for us when we checked in. The stylish wet bar counter make the parlor room perfect for entertainment. The room is incredibly clean, as the hotel has just been recently renovated. Every room is provided with the Sleep Advantage Program which includes soft, seven-layer bedding as well as the Crowne Plaza Bath Program, which comprises of luxury towels and an upgraded shower. No wonder we slept like babies until 10am the next day. It is seriously one of the comfortable hotel beds that I have ever slept on. For a foodie like me, I always love to check out the hotel restaurants as soon as I check in. The hotel houses a Chicago Fire Oven, which is known for its exceptional America cuisine, and their special rustic stone fire oven. Some of my favorite dishes include the Mediterranean pizza which tastes like a slice of heaven. The grilled steak & blue cheese is extremely flavorful and the steak is quite tender. If you love shrimp, you definitely need to try the exceptionally scrumptious Shrimp Limone. Roxy and I tried also enjoyed a glass of the hotel’s signature martinis, the Hawaiiian vcation, at the chic Visibility bar while we watched a tennis match between Nadal and Federal on their 55 inch HD TV. We had a nice conversation with a couple who was here for their 10 year wedding anniversary. 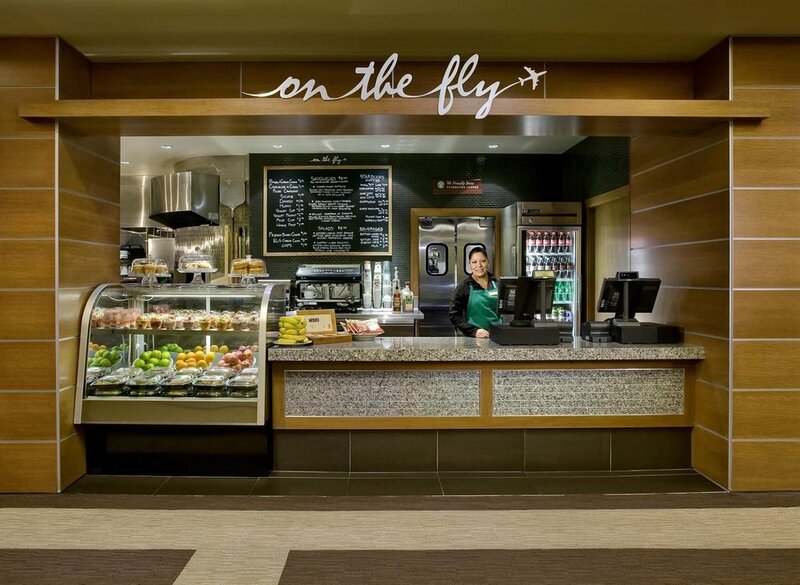 The hotel also has a convenient Starbucks and snacks cafe - On The Fly for occasions where you might be in a rush or grab breakfast on the go. They serve popular Starbucks beverages, freshly baked goods, delicious salads, filling sandwiches, and other delights. It’s an economic and fast way to grab a bite. I am also exceedingly impressed by the hotel’s fitness center. 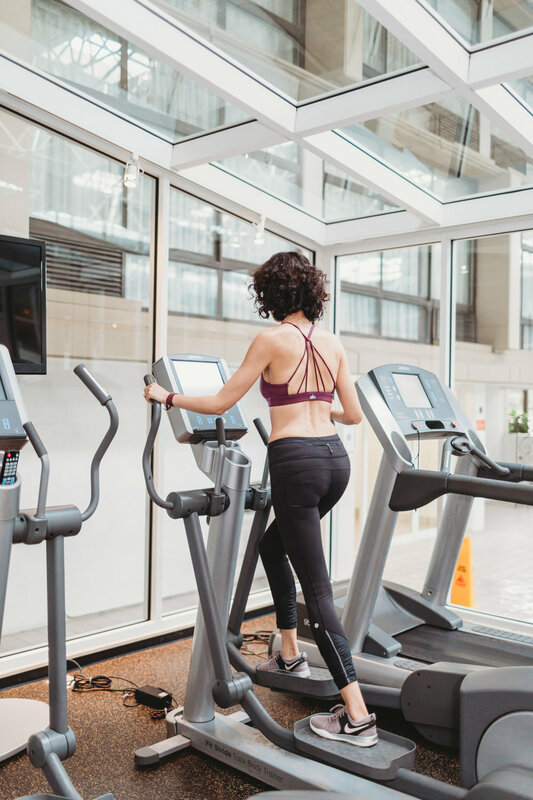 It comes equipped with Life Fitness machines and free weights. 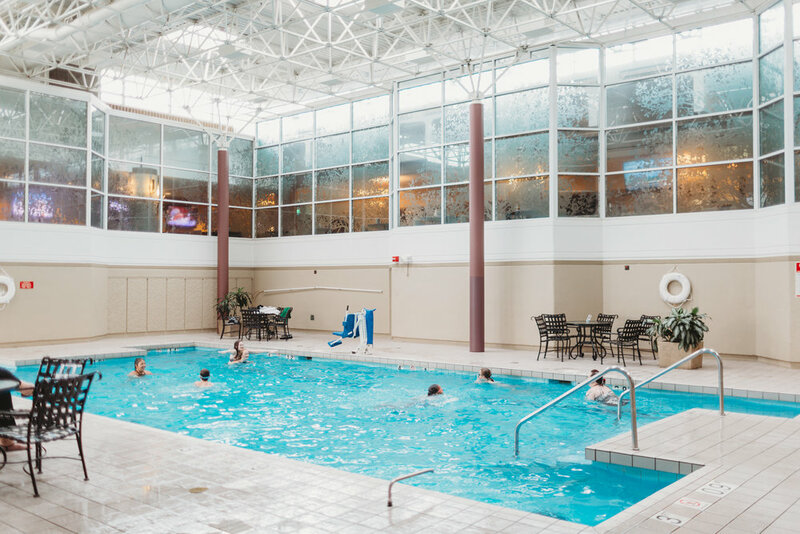 After I finished my 4 miles on the elliptical machine, I then headed to the heated indoor swimming pool for a much needed stretch. The Crowne Plaza O’hare Hotel and Conference Center is just minutes from the airport. If you are visiting Chicago, there is free shuttle bus to and from the airport, which can help you save on the pricy parking cost of some of the city hotels. Some of them charge over $70 for overnight parking. Roxy and I had a great time staying at the beautiful Crowne Plaza O’Hare hotel & Conference Center. We managed to score some really nice designer pieces at a big discount. If you would like to do more than just shopping, the hotel serves as a great location to reach other sites for activities. For a taste of culture, you could attend a concert at Rosemont Theater, or visit Muvico for the newest films. Less than a mile lies the parkway bank park. This complex features eateries and entrainment venues such as a comedy club, cinema, and a bowling alley. Additionally, the All State Arena is just a mere 3 miles away. For concerts and sporting events, guests are encouraged to visit Allstate Area. This multi-sport arena is home to the Chicago Wolves, an AHL hockey team, and the Chicago Sky, who play basketball in the WBNA. Rosemont Dome is 0.8 miles away. This indoor sports arena contains two baseball/softball diamonds and their supporting facilities, so make sure to catch a game when you’re in town. Finally, if you bring kids when you come to Chicago, don’t forget to visit the Brookfield Zoo (13 miles away) or the Six Flags Great America theme park (25 miles away) for some family fun. One more thing for pet owners, the hotel is pet friendly and they do offer you the chance to bring along and house your little companions for only a mere $50. Ultimately, my experience at The Crowne Plaza O’hare Hotel and Conference Center has already had me planning my next staycation. The hotel has a warm community feeling and everyone here is incredibly friendly. I highly recommend this hotel if you are planning your visit to Chicago. There are several packages on the hotel’s website and I am positive you can find one suitable for you. I hope you treat yourself to this amazing experience! For more information on booking your summer vacation, staycation or conference, click here. Thank you to the Crowne Plaza O'hare Hotel and Conference Center for hosting our short escape!! !